Thursday, Dec. 13, 2018, 4 – 7 p.m.
Are you interested in working "behind the scenes" for a campus-wide event? This is a great opportunity to work hands on with other student leaders as we take part in one of the biggest UWT events during this time of year. 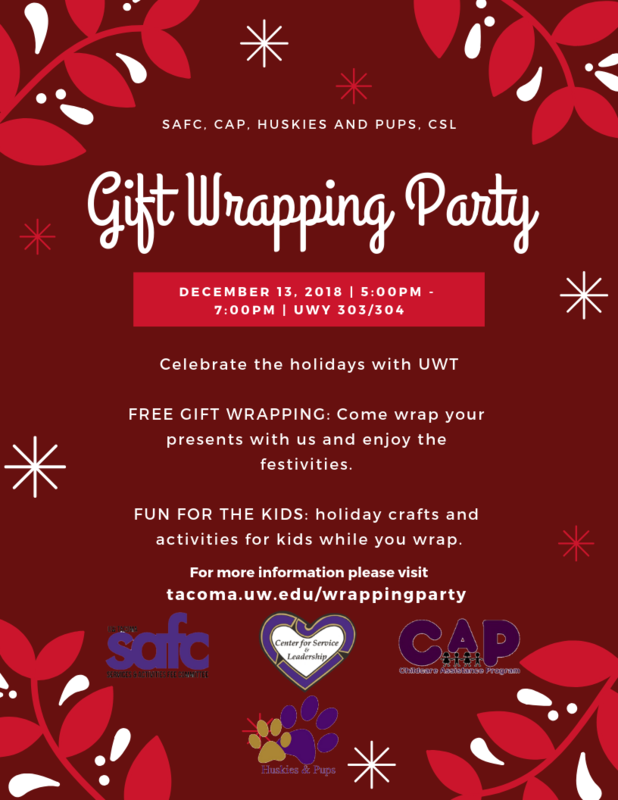 Members from Organizations such as the UWT Service Coalition, Husky Volunteers, Huskies and Pups, and the Student Veterans Organization will be joining forces to coordinate this universal celebration of holiday cheer! o Supervise the bouncy house? o Help make cookies with kids? o Help setup the cookies and coco? o Play games with kids? o Help with photos and DJ?